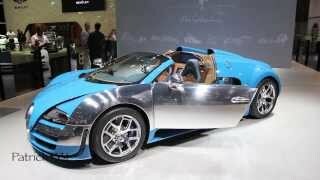 Bugatti has unveiled the latest limited edition Veyron called the Veyron Legend Meo Constantini at the Dubai Motor Show. 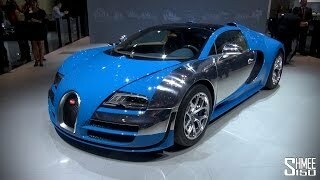 The car is the third in a series of six models designed to pay homage to influential figures Bugatti history. The first two honored Jean-Pierre Wimille and Jean Bugatti. Costantini is known for racing Bugattis in the 1920s and also captured two Targa Florio wins. Costantini was a close friend of Ettore Bugatti. The exterior of the model is primarily constructed of carbon fiber. Some parts are rendered in aluminium. The new paint color "Bugatti Dark Blue Sport" has been specially developed for the vehicle and references France's classic motor sport color, as well as the Type 35. Another special feature of this car is that individual parts have two different paint finishes. The interior is completely upholstered in leather. Major parts are all in the color "Gaucho", a sophisticated cognac tone. The seat's side cushions, arm rests, extended center console, door panels, dash panel, instrument panel and steering wheel are all trimmed in dark blue leather in the "Lake Blue" color. The car is based on the Bugatti Veyron 16.4 Grand Sport Vitesse and powered by the 8-liter W16 quad-turbocharged engine that sends 1,200 horsepower and 1,106 lb-ft. of torque to all four wheels via a seven-speed dual-clutch transmission. It can accelerate from 0-100 km (0-62 mph) in 2.6 seconds. It has a top speed of 408.84 km (253 mph), making it the fastest production roadster ever built.